Let me make it up to you. 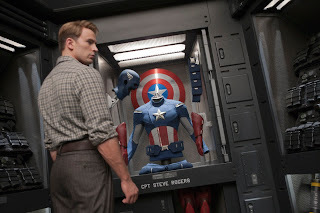 Click on the pic of Captain America below, and you can see the brand new trailer released this morning for the upcoming Avengers movie. Sadly, I couldn't just embed it on the page. It is very awesome. That is all. Enjoy. I'm going to play devil's advocate here and say that this is a relatively underwhelming trailer and worst of all a real missed opportunity. I know it's very early days and they've still got a lot of work left, but we've seen all these characters individually before. What we haven't seen is them working as a group, and yet the trailer focuses mostly on solo shots of the characters. The brief bit of verbal interaction that we do see is two straight lines delivered to Stark who makes a monotone sarcastic one-liner response. And I hope he's got more in him this round than being the ad-libbing smartass. I also get why they don't want to reveal the real threat that Loki is working with, but without some hint this trailer is all effect and no cause. We see a lot of cars blowing up, but why? Who or what's doing it? And Iron Man is flying around looking for action, but against what? There's no threat to be seen? The city and sky are empty! I'm sure we'll get much better than this. Local Toy Fair Haul! : Ewoks! Alf! Rock Lord!?? Clone Wars Recap S4 E06: Nomad Droids! Awesome New Muppets Trailer Is Awesome! Darth Maul Returns to The Clone Wars: Teaser! Yardsailing: Can You Name These Action Figures? Fruitless Pursuits Podcast: Episode Four. Bored To Death returns tonight!